Mexico: The Mexican revolutionary Pancho Villa is killed in his Dodge roadster by 7 riflemen in an ambush at Parral, Chihuahua. Germany: German Chancellor Franz von Papen dissolves the Prussian government. Germany: Hitler's Government signs a concordat with the Vatican. In return for a Papal agreement not to interfere in German politics, the Germans confirm all the confessional rights of the Catholic Church and the right to Catholic education. On the same day, the German government abolishes the jurisdiction of civilian law over the military. Germany: The SS (Schutzstaffel) becomes an independent organization from the SA. Spain: Day 4 of 985 of the Spanish Civil War. The Nationalists occupy the Military Academy in the Alcazar fortress. In Madrid, the Spanish Prime Minister appeals to the French Socialist Government for arms and supplies while the Nationalists appeal to Germany and Italy for the same. Spain: Day 369 of 985 of the Spanish Civil War. CBI - China: Day 14 of 2,987 of the 2nd Sino-Japanese War. Day 14 of 33 of the 2nd Battle of Hebei. Day 7 of 22 of the Battle of Tainjin-Beijing. Spain: Day 734 of 985 of the Spanish Civil War. CBI - China: Day 379 of 2,987 of the 2nd Sino-Japanese War. Day 40 of 139 of the Battle of Wuhan. UK: The United Kingdom puts a limit on Jewish immigration to Palestine. Germany: 2,000 Nazi Party members arrive in the Free City of Danzig. CBI - China: Day 744 of 2,987 of the 2nd Sino-Japanese War. Day 37 of 68 of the Battle of Tianjin. CBI - Mongolia: Day 71 of 129 of the Battle of Khalkhin Gol, a border dispute between the Soviet Union and Japan. USA: President Roosevelt signs the "Two Ocean Navy Expansion Act" as the first step in preparing the US for war against either Germany or Japan, or both. UK: The British government suspends the sale of new cars. ETO - UK: Day 11 of 114 of the Battle of Britain. In the Channel, the Luftwaffe sinks the transport ship PULBOROUGH and damages the destroyer HMS BRAZEN off Dover. ETO - Germany: The RAF bombs Düsseldorf and Wismar. MTO - Libya: British Swordfish torpedo bombers from carrier HMS EAGLE attack at Tobruk, sinking the Italian destroyers OSTRO and NMEBO and the transport ship SERENO. East Africa: Day 41 of 537 of Italy's East African campaign in the lands south of Egypt. CBI - China: Day 1,110 of 2,987 of the 2nd Sino-Japanese War. Day 249 of 381 of the Battle of South Guangxi. UK: In a broadcast to the people of occupied Europe, Winston Churchill inaugurates the "V for Victory" campaign, which will include the hand sign, the written letter and even the rhythmic dit-dit-dah of morse code, ironically a perfect fit to the opening bars of German composer Beethoven's Fifth Symphony. In a BBC broadcast on Jan 14, 1941, the director of the Belgian French-speaking broadcasts suggested that Belgians use a "V for Victory" hand sign as a rallying emblem during the war. He said "the occupier, by seeing this sign, always the same, infinitely repeated, would understand that he is surrounded, encircled by an immense crowd of citizens eagerly awaiting his first moment of weakness, watching for his first failure." It caught on quickly throughout all Allied nations. A BBC broadcast by "Colonel Britton" on 19 Jul 41 introduced the "V Army," again calling on the people of occupied Europe to resist the Nazis under the slogan "V for Victory." 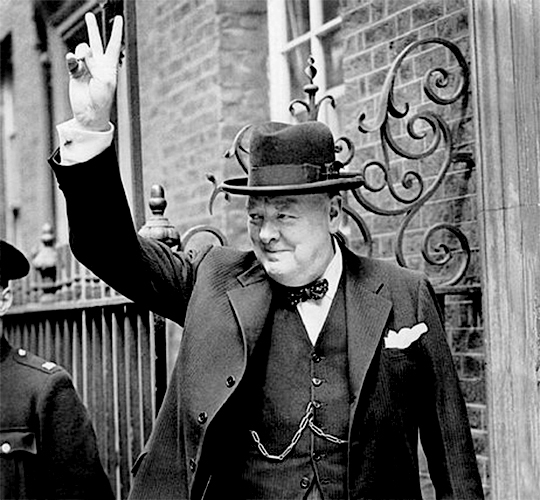 When Winston Churchill began flashing the V for victory hand sign, he did so with his palm in. Later in the war he used palm out, a change made after it was explained to him that in lower classes in Britain, it was an insulting, offensive gesture. South America: Day 16 of 27 of the Ecuadorian-Peruvian War, a territorial dispute between Peru and Ecuador. USSR: Stalin declares himself the Soviet Defense Commissar. The Soviet Union resumes diplomatic relations with the countries occupied by Germany. Russian Front - Finland: Day 22 of 142 of Operation SILVER FOX, a joint German-Finnish campaign to capture the Russian port of Murmansk in the Arctic. The Soviet destroyer SREMITEL'NY is sunk by German aircraft at Kolafjord north of Murmansk. Russian Front - Finland: Day 20 of 140 of Operation ARCTIC FOX, a joint German-Finnish campaign against Soviet Northern Front defenses at Salla, Finland. Russian Front - Finland: Day 29 of 164 of the Battle of Hanko. More German troops arrive at Bengtskär island. Russian Front - Finland: Day 11 of 18 of Finland's reconquest of Ladoga, Karelia. The Finns continue their offensive on Lake Ladoga northeast of Leningrad. Russian Front: Day 29 of 167 of Germany's Operation BARBAROSSA, the invasion of the USSR. Russian Front - North: Heavy fighting between German and Soviet troops continues near Lake Peipus outside Leningrad. Russian Front - Center: Day 15 of 31 of the 1st Battle of Smolensk, Russia. Russian Front - Center: Day 8 of 12 of the Battle of Zhlobin, Belarus. Russian Front - South: Day 6 of 25 of the Battle of Uman, Ukraine. Russian Front - South: Day 19 of 21 of the Battle of Bessarabia, Russia. German and Romanian troops continue their attack at Bessarabia to take the land and city that Romania was forced to cede to the USSR a year ago. MTO - Italy: Italian torpedo boat CIRCE sinks the British sub HMS UNION southwest of the Italian island of Pantellaria between Sicily and Tunisia. MTO - Libya: Day 102 of 256 of the Siege of Tobruk. East Africa: Day 406 of 537 of Italy's East African campaign in the lands south of Egypt. CBI - China: Day 1,475 of 2,987 of the 2nd Sino-Japanese War. USA: Congress establishes the Legion of Merit as an award to be given for exceptional meritorious conduct to personnel of the armed forces of friendly foreign nations as well as to US military personnel. USA: The first members of the US Women's Army Auxiliary Corps begin training at Fort Des Moines, Iowa. Atlantic: In Canada, German sub U-132 enters the Gulf of St Lawrence and damages some ships in an Allied convoy. Germany: Wilhelm Keitel comes up with the idea of branding Soviet POWs and slave laborers on the buttocks, similar to how one would treat cattle. Russian Front - North: Day 316 of 872 of the Siege of Leningrad. Russian Front - North: Day 77 of 658 of the Siege of the Kholm Pocket. Russian Front - Center: Day 19 of 22 of Germany's Operation SEYDLITZ, a plan to trap and capture numerous Soviet troops. Russian Front - South: Day 23 of 27 of the Battle of Voronezh, Russia. Soviet troops recapture the German bridgehead on the Don River. Russian Front - South: Day 23 of 150 of Germany's CASE BLUE, the failed offensive to take the Caucasus oil fields. MTO - Egypt: Day 20 of 27 of the 1st Battle of El Alamein. Mussolini abandons his "Victory March on Cairo" and returns to Rome. MTO: US Middle East Air Force: The HALPRO Bomb Squadron (B-24s) and 9th Bomb Squadron (B-17s) are organized as the 1st Provisional Bomb Group under Colonel Harry A Halverson's command at Lydda, Palestine. East Africa: Day 77 of 186 of the Battle of Madagascar. CBI - China: Day 1,840 of 2,987 of the 2nd Sino-Japanese War. Day 67 of 124 of Japan's Zhejiang-Jiangxi Campaign, launched to punish anyone suspected of aiding the Doolittle raiders in China. Roughly 250,000 Chinese will be killed. US 10th Air Force bombs the docks and warehouses at Chinkiang on the Yangtze River. PTO - Alaska: Day 44 of 435 of the Battle of Kiska, Aleutian Islands. On Unalaska Island, the US Navy establishes Naval Air Facility Dutch Harbor and Naval Operating Base Dutch Harbor. PTO - Malaya: Day 152 of 357 of the Battle of Timor Island. PTO - New Guinea: The Japanese Air Force attacks at Port Moresby. PTO - New Zealand: Suzanne Walker becomes the first enlisted member of the Women's Royal New Zealand Naval Service. Atlantic: UK and US bombers sink the German subs U-558 and U-195 in the Bay of Biscay northwest of Cape Ortegal, Spain. Germany: German government reports that since 02 Mar 43 there have been 20 transports of Jews from the Netherlands to Sobibor Concentration Camp, totaling over 34,000 persons. Only 19 of these deportees will survive the Holocaust. Germany: The National Committee for a Free Germany (NKFD) makes a broadcast of its manifesto to Germany from the Soviet Union. Russian Front: The Soviet Stavka orders all partisans throughout German-occupied Europe to attack German rail traffic. Russian Front - North: Day 681 of 872 of the Siege of Leningrad. Russian Front - North: Day 442 of 658 of the Siege of the Kholm Pocket. Russian Front - Center: Day 16 of 50 of the Battle of Kursk, Russia. German troops evacuate Mtensk. Russian Front - Center: Day 9 of 38 of the Battle of Orel, Russia. Russian Front - South: Day 8 of 48 of the USSR's Lvov-Sandomierz Offensive. The surrounded German troops at Brody keep trying to fight their way out but are stuck. MTO - Italy: Day 12 of 40 of the Battle of Sicily. RAF and US Air Forces provide air support. The Italians surrender to US forces en masse in western Sicily. The Canadians start to push around Mt Etna as the Catania drive falters. MTO - Italy: US 9th Air Force bombs Rome for a second day in a row, hitting marshalling yards and the Ciampino Airfield. CBI - Burma: US 10th Air Force attacks targets at Mandalay. CBI - China: Day 2,205 of 2,987 of the 2nd Sino-Japanese War. US 14th Air Force bombs at Tengchung and attack river traffic and railroads found along the way. PTO: The HMAS HOBART is put out of action by a torpedo attack from a Japanese submarine west of New Hebrides. PTO - Alaska: Day 409 of 435 of the Battle of Kiska, Aleutian Islands. PTO - Hawaii: The underground oil storage facility at Red Hill in Pearl Harbor is completed. PTO - New Guinea: Day 90 of 148 of the 2nd Battle of Lae-Salamaua. US 5th and 13th Air Forces provide air support. PTO - Solomon Islands: Day 31 of 67 of the Battle of New Georgia. US 5th and 13th Air Forces provide air support. Germany: Operation VALKYRIE is launched in an attempt to assassinate Adolf Hitler and to overthrow the Nazi government. 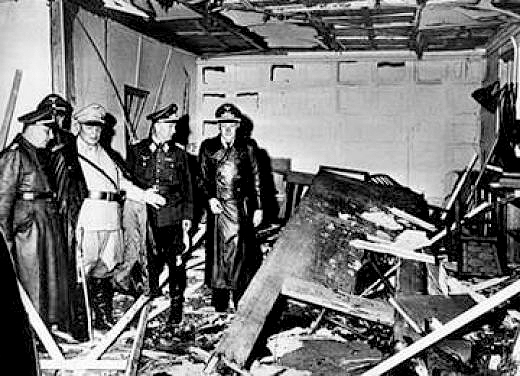 Lt Col Claus von Stauffenberg sets off a bomb inside Hitler's Wolf's Lair field headquarters, but Hitler survives the blast. Stauffenberg will be executed shortly after midnight. The 20 Jul 44 plot was the culmination of the efforts of several groups in the German Resistance to overthrow the Nazi-led German government. The failure of both the assassination and the military coup d'état which was planned to follow it led to the arrest of at least 7,000 people by the Gestapo. According to records of the Führer Conferences on Naval Affairs, 4,980 of these were executed, resulting in the destruction of the organized resistance movement in Germany for the remainder of the war. Atlantic: British destroyer HMS ISIS is sunk, either by a German naval mine or by a German torpedo off Normandy, France. Atlantic: German sub U-861 sinks the Brazilian troop transport VITAL DE OLIVIERA off Brazil. ETO - UK: Day 38 of 86 of the V-1 "Buzz Bomb" offensive on Britain. ETO - France: Day 45 of 49 of Operation OVERLORD, the Allied invasion of Normandy, France, known forever simply as D-Day. D-Day+44: Allied Air Forces provide air support. US troops at St Lo begin preparing for a break out of Normandy. ETO - France: Day 45 of 62 of the Battle of Caen. Heavy rains over the next two days put an end to Operation GOODWOOD after 413 British tanks are lost. ETO - Germany: Although set to return to the US, top American fighter Ace Francis "Gabby" Gabreski sees his squadron is shorthanded and decides to fly "just one more" only to fly too low over a Luftwaffe runway, clip his propellor and crash land. He flees into the woods and evades capture for 5 days before being caught. ETO - Germany: US 8th Air Force bombs oil and industrial targets in central Germany. Russian Front - Finland: Day 30 of 50 of the Battle of Karelia. Soviet troops continue their offensive against the Finns in eastern Karelia between Lake Ladoga and Lake Onega in northern Russia. Russian Front - North: Day 170 of 191 of the Battle of the Narva Isthmus, Estonia. Both German and Soviet troops remain locked in their defensive positions. Russian Front - Center: Day 16 of 16 of the Battle of Vilnius, Lithuania. Soviet troops liberate Vilnius. Russian Front - Center: Day 16 of 27 of the Battle of Siauliai, Lithuania. Soviet troops are now in Latvia. Russian Front - Center: Day 16 of 23 of the Battle of Belostock, Poland. Russian Front - Center: Day 8 of 15 of the Battle of Lvov, Poland. The Soviets have trapped 40,000 German troops at Brody, Poland. Russian Front - Center: Day 8 of 15 of the Battle of Stanislav, Poland. Russian Front - Center: Day 3 of 16 of the Battle of Lublin, Poland. MTO - Germany: US 15th Air Force B-17s and B-24s bomb targets in Germany. MTO - Italy: The US 5th Army pushes close to Pisa. French troops begin withdrawing from Italy in preparation for the invasion of southern France. CBI - Burma: Day 138 of 166 of the UK's Operation THURSDAY. US 10th Air Force provides air support. CBI - Burma: Day 133 of 147 of the Battle of Myitkyina. US 10th Air Force provides air support. CBI - Burma: Day 111 of 302 of the Chinese Salween Offensive. US 14th Air Force provides air support. CBI - China: Day 2,571 of 2,987 of the 2nd Sino-Japanese War. Day 95 of 259 of Japan's Operation ICHI-GO. Day 29 of 48 of the Battle of Hengyang. US 14th Air Force provides air support. PTO - Caroline Islands: US 7th Air Force B-25s bomb targets in the Truk Atoll. PTO - Dutch New Guinea: Day 19 of 61 of the Battle of Noemfoor. Although the island has been declared secured, bitter fighting from Japanese continues. PTO - Mariana Islands: US warships continue to bombard Guam. US 7th Air Force bombs on Tinian Island and Ponape Island. PTO - New Guinea: Day 55 of 83 of the Battle of Biak. There are still 3,000 Japanese soldiers on the island who won't give up. PTO - New Guinea: Day 219 of 597 of the Battle of New Britain. US 13th Air Force provides air support. PTO - New Guinea: Day 90 of 481 of the Battle of Western New Guinea. 5th Air Force provides air support. PTO - New Guinea: Day 37 of 80 of the Battle of Lone Tree Hill. PTO - New Guinea: Day 11 of 47 of the Battle of Driniumor River, a failed Japanese offense on US troops near Aitape. US troops begin the struggle for the heights overlooking Tambu Bay and Dot Inlet. PTO - Solomon Islands: Day 263 of 295 of the Battle of the Bougainville Islands. US 13th Air Force provides air support. Belgium: Achille Van Acker recommends the abdication of King Leopold III of Belgium. Germany: At Potsdam, US President Truman declares that the Allies will demand no territory upon victory. CBI: US 14th Air Force hits a number of targets in China and French Indochina. CBI - China: Day 2,936 of 2,987 of the 2nd Sino-Japanese War. PTO - Alaska: US 11th Air Force bombs the Matsuwa Airfield on Matsuwa Island in the Kurile Islands. PTO - Borneo: Day 41 of 67 of the Battle of North Borneo. US 5th and 13th Air Forces provide air support. PTO - Dutch East Indies: Day 20 of 21 of the 2nd Battle of Balikpapan. PTO - Japan: The HMS INDEFATIGABLE joins the UK and US Navies for an attack on the Japanese home islands. PTO - Japan: US 20th Air Force B-29s begin a series of small raids on 12 Japanese cities, candidates for an atomic bomb, to familiarize the aircrews for a successful raid. PTO - New Guinea: Day 571 of 597 of the Battle of New Britain. US 10th Air Force provides air support. PTO - New Guinea: Day 455 of 481 of the Battle of Western New Guinea. US 10th Air Force provides air support. PTO - Philippines: Day 273 of 299 of the 2nd Battle of the Philippines, aka the Liberation of the Philippines or the Philippines Campaign. PTO - Philippines: Day 218 of 244 of the Battle of Luzon. The battle is said to over but hold-outs will continue fighting until the end of the war. PTO - Philippines: Day 133 of 159 of the Battle of Mindanao Island. The battle is said to over but hold-outs will continue fighting until the end of the war. PTO - Philippines: Day 125 of 135 of the Battle of the Visayas region. The battle is said to over but hold-outs will continue fighting for several weeks. Dutch East Indies: The Dutch authorize a "Police Action" involving three divisions on Java and three Brigades on the larger, but less populated, Sumatra. Israel: An armistice with Syria is signed to de-escalate the 1948 Arab-Israeli War, also known as the Israeli Independence War.